Who hasn’t at some point made an impulse purchase during a spell of gray and rainy days? 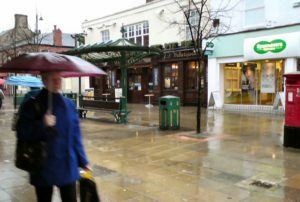 It’s no secret that weather affects people’s moods and behaviours, which in turn affects the retail industry on a day-to-day basis. During a downpour people are much less likely to shop in-store, whereas grocery delivery services profit from people who don’t want to leave the house. An insight like this is obvious, but in today’s data-driven world, running weather-related analysis on your business data provides insights that are not immediately apparent. For example, as a retailer you would generally assume that ice cream sales will spike when the weather gets hotter. In the UK, however, ice cream sales rise only until it’s 25 Celsius, and then begin to decline. The reason? In a society where more people walk home from the supermarket, consumers are worried that their ice cream will melt in hot weather. An insight like this might not be obvious unless you regularly compared weather against sales and then investigated more closely. Weather-based analysis is already normal practice for industries that produce ice cream, but other industries have not necessarily considered how even tiny shifts in temperature change the habits of consumers. So, for every increase of one degree Fahrenheit, you can expect to sell an additional 8% more strawberries, or 1.2% more beer. This is a simplified model, but by performing algorithms using historical weather data and your sales metrics, you can determine how fluctuations in temperature affect your own business. With this information handy, you can make appropriate stock orders, tailor your personalized offers and even schedule digital advertising to reflect the upcoming forecast. For example: Stella Artois determined that there was a 2-degree Celsius temperature range in which their cider sales were optimal. They were then able to use that information to purchase digital advertisements that would only show during that temperature range, and boosted their sales by 66% YoY. Yet manually tracking small fluctuations in weather against performance to determine these trends is time consuming, and traditional seasonal business has been thrown on its ear thanks to climate shifts. During a cold Halloween season, the sale of candy suffers, and if you’re not prepared to adjust your stock and pricing, you’ll be left selling a large bulk of candy post-Halloween at a steep discount. This where owning a weather data feed can help. You can perform algorithms on your sales data to determine how weather affects your overall business, and discover trends that might not have been otherwise apparent. This in turn allows you to modify your long-term strategy. Weather data can also help normalize your sales data for more accurate assessment of other performance factors. With weather forecast data, you can set up tabs in your dashboard or automated alerts that suggest actions such as stocking or staffing for the week ahead to maximize your profits. Optimize market baskets by discovering the top selling items for certain weather conditions, and ensure affinity items are set up nearby and priced appropriately. Digital loyalty programs can also take advantage of the weekly forecast to determine what personalized offers would make the most impact. If you’re looking to discover and leverage weather-based findings from your metrics, Project X can help. Learn more about our weather data feed here, including both historical and forecast data, and don’t hesitate to reach out to us to discuss your own weather use cases.